How does one have freedom in a world in which karma exists? Doesn't the necessity of one's karma eliminate the possibility of chance? 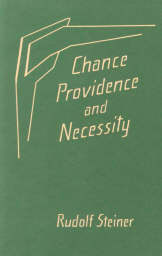 And if so where does "the kindly care of God," as my Collins dictionary defines providence, fit into the scheme of things? Steiner answers all these questions and more in the short 148 pages of these eight lectures. First Steiner introduces us to Fritz Mauthner who imagines chance to be like a child buying a surprise package from a booth at a fair and discovering as she pulls each item from the package the wonderful things the seller had placed into the package. Such surprise packages were a lot more common when I was a child than they seem to be today. I soon learned that the wonder-full anticipation that I experienced in retrieving the items from the package was always quickly extinguished by the reality of its revealed contents. Amazingly the value of the contents was always less than the price of the surprise package! Which is no longer a surprise to me. Likewise, it should be no surprise that those people who expect the truths of life to come quickly and easily to them as if from a wonderful surprise package are often left with a pale semblance of truth. Without working for truth themselves, they are left to pluck truths from a package others have assembled, but nevertheless they are eager to share these truths with all who will stop to listen. However, because their truths have not been figured out independently, but merely borrowed from others' thoughts, their words soon become repetitious and familiar sounding. [page 11-12] It is a very common thing, these days, to encounter people who declare that they think this or that to be a fact. The typical reaction one has in such encounters is how fortunate and at the same time how simple-minded such people are — fortunate, because they have no idea what it really means to believe in something they have figured out, and simple-minded because they don't have a glimmering of how far removed from reality their thoughts may be. . . . So it was natural for even one of the most learned men to fall into childish error such as that demonstrated in connection with solving the cosmic problem of chance and providence. After this acerbic prologue, Steiner goes on to build a "spiritual scientific approach to the concepts of chance, necessity, and providence." But first he needs to lay a foundation on the facts surrounding the alteration of waking and sleeping in the human being. Materialistic science says that man sleeps because he is tired and wakes up when rested and it is accepted as gospel truth by many. Yet, the facts point to something different, which one could figure out for oneself, if one took the trouble. Steiner uses the example of the rich dilettante who comes to his lectures and falls asleep. Here is a man who doesn't do much work, and yet cannot stay awake during the lecture while others who work long hours yet stay wide awake. The man is more interested in his inner world than the outer world of the lecture and enjoys that inner world by going to sleep, while the assiduous listener is interested in the outer world and stays awake to participate in understanding the subject. We sleep as humans when our interest moves into our inner world more than our outer, and, like the Earth, our interest moves through a diurnal cycle. This is something that one can figure out for oneself. It makes as little sense, Steiner says, to say that day is the cause of night as it is to say that our being awake is the cause of our going to sleep. What we can notice is that our waking and sleeping is a process that parallels the day and night rotation of the Earth of which we are an integral part. As the portion of the Earth on which we reside moves between facing the Sun and facing the stars, we move from an interest in the outer world by day to an interest in our inner world by night. During the light of the Sun we are interested in harvesting the exterior of things and during the night we are interested in harvesting the interior of things. During the day we see the exterior of ourselves and our fellow humans, and during the night we see the interior of ourselves and our fellow humans. [page 25-26] We became materialists when we learned to look directly at our fellow human beings instead of seeing their auras. That was brought about as a result of luciferic developments that made it possible to begin to see ourselves with day-waking consciousness. This explains why Adam and Eve went around naked in the Garden of Eden before the Fall: the record of this in the Bible is a testament to the reality that humans were clothed by their auras before then(1). External clothing only came in existence to replace our direct perception of others' auras — others' internal spiritual realities — once that direct perception fell away from our day-waking consciousness. What we do when we choose which clothes to wear for a particular day or occasion is to choose clothes that mirror what infuses our spiritual, our internal reality, for that occasion. If we don't choose our clothes carefully, our clothes reflect that condition just as directly as if we do, as anyone who has been on an important job interview can attest. With this insight, which anyone can figure out for oneself, the colorful headdresses of native American warriors, plumes on European war helmets, face paintings of warriors of all nationalities suddenly begin to make good sense. One must start by removing from one's eyes the blinders of materialistic science, which blinders have directed our gaze to the surface of things, up until now. [page 26] And when that innocence was lost and human beings were condemned to a materialistic way of life, meaning that they could no longer perceive auras, they saw what they had not seen while the aura was still perceptible, and they began to replace auras with clothing. That is the origin of clothing; garments replaced auras. Some of you may be thinking, "Well, clothing is needed to keep warm, isn't it?" Yes, it is now, but that was not the case in the beginning for humanity as it is metaphorically portrayed in the Genesis story of Adam and Eve. The alteration of seasons requiring clothing during winter months undoubtedly accompanied the Fall and its concomitant loss of direct perception of auras in the native or original clairvoyant sight of our earliest ancestors. One of the crucial lessons of human psychology that I had to figure out for myself was that what we try to hide as humans, we advertize. When we tell an untruth, for example, what we hide in our words, as any polygraph operator knows, we reveal in our skin resistance, pulse rate and respiratory rate changes. The lie detector maximizes exactly those elements of truth that the liar attempts to minimize. Our clothing choices, rightly understood, likewise reveal much about our inner and otherwise hidden reality. [page 26] And it is actually a good thing in our materialistic age to know that people clothed themselves for no other reason than to emulate their aura with what they wore. That is especially the case with rituals, for everything that is worn on such occasions represents some part of the aura. Whether it's in the changes of consciousness between waking and sleeping or the changes of consciousness from our early ancestors to today, these variations of consciousness are important to the subjects of these lectures. [page 34] But we want to concentrate on nuances of consciousness, for unless we do so we will not be able to achieve an understanding of necessity, chance, and providence. Many of us, dear Readers, have likely wondered at some point in our lives, "Why am I here?" But probably few of us have ever made the connection with necessity in the form that Faust did or came up with his answer. [page 38-39] Why am I present at this point in evolution? What brought me here? What necessity, running its course through what we call history, introduced me into historical evolution at just this moment? Faust asks these questions out of the very depths of his soul. And he believes that they can be answered only if he understands "productive powers and germs," understands, in other words, how outer experience contains a hidden clue to the way the thread of necessity runs through everything that happens. Here we encounter an amazing concept: "productive powers and germs." What is a germ, but an "elemental thing" as one dictionary puts it or "that from which anything springs as from a seed" as another one does. If one were to look at a producing garden and ask what was necessary for the garden to be so fruitful, the farmer may well answer, "I planted good seeds and assisted their productive powers during their growth." When we broaden the scope of our purview to the entire Earth and ask about what makes it so fruitful, we must answer the productive powers in humankind. If we ask, "Why am I here?" and we understand the answer to be "productive powers and germs," we are brought to focus on the things that rise in each of us as a seed and how its productive powers, fully in flower, creates seeds that spring from us and arise in the rest of humanity. These seeds are the contribution we each make to the evolution of consciousness, to the evolution of humanity, to the evolution of the Earth. Mauthner was a materialistic scientist and if he were to try to explain the history of art from the Greek or Egyptian time to the present day, he would examine their art and ignore their ideas. Steiner tells us that Hegel proceeded in the opposite fashion: he began with their ideas and proceeded to derive their art from their ideas as a matter of necessity. In doing so, Hegel was able to perceive that art always begins looking "ugly", moves to "refined," and ends up looking "classic". One can perceive these varieties of paintings in any large museum of art today, except that the "ugly" is called "modern art," the "refined" is called "Impressionism" and the "classic" is the art of Leonardo and other Renaissance painters. [page 41-42] In other words, the idea will not at first have wholly mastered matter, but expresses itself symbolically in it, a sphinx to be deciphered, as Hegel sees it. Then, in its further development, the idea gains a further mastery over matter, and harmony then exists between the mastering idea and its external, material expression. That is its classic form. When, finally, the idea has worked its way through the material and mastered it completely, the time will come when the over flowing fullness of the world of ideas will run over out of matter, so to speak; the ideal will be paramount. At the merely symbolic level, the idea cannot as yet wholly take over the material. At the classic stage, it has reached the point of union with matter. When it has achieved romantic expression, it is as though the idea overflowed in its fulness. . . . Then we must rediscover in the outer world what the world spirit first gave us in thought form. One matter of extreme importance, by which I mean "well worth the effort to learn to make the distinction in oneself," is the difference between a mental image and a concept. To a materialist scientist like Mauthner there was no discernible difference: he operated at the level of mental images. Mental images are like plucked roses or butterflies pinned on a chart — they have little connection with the living world of which they are not a part any more. Taken from the living world of productive powers and seeds, they have become frozen relics, unable to move, grow, or reproduce any more. Concepts are living creatures overflowing with productive powers and seeds. That is the difference between mental images and concepts. You cannot take my word for this or you will simply be making a mental image, which will not be productive for you. By working with the mental images created in yourself during the reading and contemplating of these words you have the possibility to create a living concept within yourself. And once you have done that task, you will have created a source of "productive powers and germ" within yourself that will stay with you forever and serve you and the rest of humanity well. A concept arrived at in this way, the only way possible, rightly understood, will become your "primary property" in the sense of property as defined operationally by Dr. Galambos. You will own it because it will have arrived as a derivative of your life and effort. You will have entered the "thread of necessity" described in the page 39 quote above. The shuttle carrying the weft thread of necessity will have flown through Steiner's life, through my life, through your life, and onwards, creating new concepts through each life it flies in the great loom of creation. [page 48] Let us explore what the difference is between the "half-asleep" status of the mere mental images with which most people are satisfied and the active possession of a concept. A concept is always in a process of inner growth, of inner activity. To have nothing more than the mental image of a table is not to have a concept of it. We have the concept "table" if we can say that it is a supported surface upon which other objects can be supported. Concepts are a form of inner liveliness and activity that can be translated into outer reality. Like the concept of primary property, we only have it as a concept when it exists in a form of "inner liveliness and activity that can be translated into outer reality." And when that is true for us, we recognize the source of the original concept as part of recognizing the thread of necessity as it flows from Dr. Galambos to this review to you and onward. And one must interpret this liveliness in a literal fashion, as Steiner indicates. [page 48] One really has an impulse to jump about for the sake of demonstrating how a true concept differs from the sleepy holding of a mental image. . . . Because we know from spiritual science that the moment something reaches the level of concept, the etheric body has to carry out this movement; it is involved with this movement. Jean Houston in her seminars teaches what she calls the 'kinesthetic body.' I remember doing an exercise with her in which we were instructed to jump forward and then back with our physical body, then repeat the same operation with our kinesthetic body. Then we jumped forward with our kinesthetic body and jumped forward with our physical body into our kinesthetic body. Something very real happened inside me when I jumped into this otherwise invisible thing in front of me. I felt it. Reading what Steiner said about "memory is a habit in the etheric body" makes me think that Jean was leading me to perform exercises involving my etheric body. [page 49] . . . we remember a thing when our etheric body has become used to carrying out the corresponding movement. We remember nothing except what the etheric body has taken on in the form of habits. Our etheric body must take it upon themselves, under the stimulus of re-approaching an object, being repeatedly brought into motion by us and thus given the opportunity of remembering, to repeat the motion they carried out in first approaching that object. And the more often the experience is repeated, the firmer and more ingrained does the habit become, so that memory gradually strengthens. There is a process that I use from time to time that I call the "unanswered question." It works like this: someone asks me a question or I form one from some knotty mental problem. Rather than answering the question with some simple answer, I hold the question unanswered with the thought, "I wonder what that really means." I forget about leaving the question unanswered until one day, an answer pops into my mind at some unexpected moment, an answer that is perfect and one that I know would never have come if I had simply answered the question with the primitive state of knowledge I had when first I came upon the question. The more generalized form of this process I call EAT-O-TWIST, which is an acronym for Everything Allways Turns Out The Way It's Supposed To, where allways points to two meanings: "at all times" and "in all ways." "Supposing" is the inner subjective process and "turning out" is the outer objective manifestation of the result. The acronym is easily remembered and spoken when I need to remind myself in some strange situation that things externally are turning out now the way they were originally supposed to. Steiner calls this process "an inner choreography that leads from the subjective into the objective." [page 56] When the human soul raises a question, it seeks an answer to it, and proceeds subjectively to set in motion all those processes, those inner or external actions, that might serve to supply it. If this process exists, one would expect it to exist at all levels from the microcosmic to the macrocosmic, that is, it would pervade both our individual lives and the life of the very cosmos in which we exist, our solar system. And in this next passage, Steiner states that fact explicitly. [page 60] Imagine yourselves transposed from earthly existence back to the ancient sun existence. We were involved there with those beings who reigned during the sun period. And we can picture these beings who went through inner, subjective soul experiences and were active during the period of that sun existence as similar to us in our present day thinking, feeling, and willing. What they went through on the sun at that time is now to be found externalized in the world around; now it confronts us from outside as world-gesture, world-expressiveness, world-physiognomy. It has become objective. If we took only science courses in college and neglected completely the arts side of our education, we can catch up later. But, not having those art courses earlier will require us to do things later in life that we would else not have to do. With this thought, we are now on a close approach to the concept of "necessity" where Steiner leads us to think about things we neglected to do earlier in our lives. [page 61] If, for example, I have been guilty of neglect in younger years in failing to educate someone whose education was my responsibility, that corresponded to my subjective state at the time. Twenty years later I can deny that I was neglectful, but that changes nothing in the objective situation that grew out of the subjective one. The individual who went uneducated became what he is as a result of what I neglected to do. The objective outcome of subjectivity takes on a necessity that cannot be denied, and necessity enters the picture to the degree that the subjective is transformed into the objective. What we cannot change in the present is the effect that our actions in the past have on it -- this is the core of what "necessity" means. Those actions happened in the past and must now come before us in "reflected form." We cannot change that reflection, Steiner says, any more than we can remove in our mirror reflection a wart from our forehead. [page 66] "Pallid dost thou appear to me, and to the eye dead. How is it that you call forth holy life from founts of inner strength?" Passive would be your enjoyment if I could show you perfection. The infomercial shows us perfection and will confer on us a pricey gift. Goethe offers us instead unanswered questions whose answers when received will confer on us a priceless gift. [page 66-67] In other words, the absence of those perfections that delight the eye or the senses in general proves elevating. Deadness overtakes those who do not attempt to take in and energetically work through what people often refer to as "pallid concepts." It is therefore necessary, if we are to banish all traces of Baroque mysticism from the spiritual science we are pursuing, to devote ourselves occasionally to a concern with concepts of the utmost precision. Now read how Steiner describes what goes on during cognitive processes and generate for yourself the unanswered question of how this might be happening in your life. [page 68] Human beings are really always outside their bodies and their bodily function with that part of them that is engaged in the cognitive process; they live inside the things under study, as I've often said. And the fact that a person comes to know something is due to the reflection in his body of this experience he has inside of things. So we can say that we are outside our bodies with one part of our perception, and our experience within things is reflected in our bodies. [page 71] Once we have arrived at a pure concept, we no longer need merely to recall it; we can always create it anew. . . . Therefore, when we form an impulse into concepts, it can be an impulse to freedom. That is what I attempted to develop at greater length in my Philosophy of Freedom (3). That is exactly the thought developed here. Steiner suggests that we investigate the process of illness only from the standpoint of the present, never from that of the past. "While there's life, there's hope." is the thought here expressed. Only if the person has died does the concept of necessity come into play — before then we do best to do all we can in the present wherein chance holds sway over necessity, and freedom to live exists. If we relate this insight to the modern metaphor of Schrödinger's Cat, we see a striking parallel. Until the box holding the cat is opened, the cat may be dead or alive and chance still exists. Once the box is opened the cat will be observed to be either dead or alive and necessity holds sway because the observation will necessarily have been made in the past. I first encountered a practical demonstration of that process from Laura Boyle who told a story to us in a seminar. She had an accident skiing in which she was rushed to a hospital with a knee injury. In the ambulance on the way to the hospital Laura considered the possibilities for her knee: from serious reconstructive surgery to a minor sprain of tendons. She applied the best visualization she knew, using all she knew about knees in general plus all the information she could access from within her knee, and constructed an image of what had happened to her knee so that the recovery would be quick and painless without surgery. And that's the way it turned out for her. Laura had developed a way of dealing with her knee injury that was fruitful for her. [page 72] We must be rigorous in adopting the standpoint that necessity inheres in the past; life rules the present. This example shows us that if we try to illumine concepts with the help of more fruitful viewpoints, we will acquire a certain knack for dealing with them. Goethe made a statement in his old age, out of the fruits of his long life and wisdom, during an episode of great suffering, "The rational world is to be looked upon as a single immortal individual engaged in a continuous bringing forth" of something that is then interwoven into the past and becomes necessity "thus making itself the master of the element of chance." Such wonderful insights as this are available to each of us if we tune our receivers appropriately and bless the transmitter from which our insights come. [page 73] A great deal of life is packed into such a saying. And the digression I would like to make is this: our insights are always to be looked upon as grace bestowed upon us. And it is just those individuals who garner knowledge from the spiritual world who are aware what a matter of grace such knowledge is when they have prepared themselves to receive it, when their being reaches out to receive what flows to them from the spiritual world. At this point we have received the concepts of necessity and chance with a hint of how providence hovers above necessity and chance in the form of grace that is bestowed on us from the spiritual world. Necessity in the form of the past is like history, the content of the historical record. Chance in the present is a process in which we are actively involved in creating freedom in the world. When we apply that process we transform the necessity of the past into our ongoing present and create the virtue called loyalty. That leads us directly to providence. [page 83] And when we ascend from the concept of loyalty to that of love, and then to what I have described in the past as grace, a state of being we have to wait for, we come to the concept of providence; we enter the world where providence holds sway. For the angels sweetest gain! This passage stumped me on my first reading I must admit, but upon later reading I found that I was just as stumped! Whatever Goethe was referring to was lost on me. Steiner's initial explication did little to enlighten me, but I offer it here as it will begin the process of understanding a spiritual truth. [page 88] The four lines quoted from Faust refer to a human state of consciousness, possessed by souls of the "boys brought forth in midnights" and "for the parents lost when granted," in other words, by souls claimed by death immediately after birth. But the verse states expressly that these souls are "for the angels sweetest gain." The words seem to be saying that the angels gain when a child dies immediately after its birth; that really doesn't explain much except the surface level meaning of the words. What is this "gain for the angels"? The explanation Steiner gives is comprehensive and extends over Lectures 6 and 7, so my summary will seem to have logical gaps perhaps that can be filled in by reading the lectures themselves. There is a phrase in Faust where a person being born is called "growing young." What Goethe referred to was the spiritual fact that our etheric bodies grow younger as our physical bodies grow older. When Faust died, he was a hundred years old and had a very young etheric body. His very young etheric body was accompanied into heaven by the very old etheric bodies of the "midnight boys" and by creating this scenario, Goethe is pointing to a powerful exchange that takes place between the etheric bodies of Faust and the baby boys. [page 114] When very young children die, those referred to in Faust as "the midnight born," their etheric bodies are very old, quite hoary in fact, but they are endowed with strong will-forces. Etheric bodies of this kind are able to work powerfully on the long-lived etheric bodies of those who grow physically old. This exchange goes on constantly between those who die at an old age and those who die at young ages. 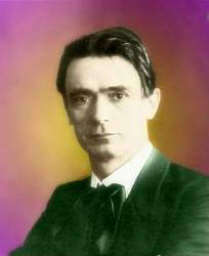 Steiner says, "This exchange is essential; without it, the evolution of humanity on earth could not proceed properly." In the time between death and a new birth, the forces of the etheric bodies of those who died young are interwoven into the seed of new humans-to-be as special talents and gifts. [page 116-117] And as we look up to people of special genius, we can attribute their gifts to the fact that some individuals die young. To contemplate the mystery of death in the case of young human beings is to realize that early death too is part of the wise design, for it gives rise to seed-forces of soul-empowerment needed by the human race for its further progress. If we can lift ourselves above a personal reaction to death to a contemplation of what is needed by mankind as a whole, we encounter the wisdom involved in the deaths of both young and old. . . . Those who die young and thus sacrifice their etheric bodies in their youth provide the entire cosmos with a fruitful soil for the growth and maturing of human soul-capabilities. The angels direct the exchange between the old and the young etheric bodies and thus the "sweetest gain" referred to by Goethe above. When we listen to people talk about those who die tragic deaths at a young age, we hear words like, "so full of promise, so much to give to the world, so much unfulfilled promise snuffed out in its prime." When looking at chance, providence, and necessity in the light of those who die at a young age, we recognize that EAT-O-TWIST never breaks — everything allways turns out the way it's supposed to. [page 134] For the beings of the higher hierarchies know what can be accomplished, not only with those of maturer years, but above all with those who have died young. There is no one who has lived in vain! And the entire evolutionary process in which humanity is involved could not go on if everything were not to happen as it actually happens.
. . . thinking his thoughts, wrestling with his passions; till I have bent myself into the posture of his hunched and peering hatred. Till I am really a murderer. And when I'm quite sure that I feel like the murderer, of course I know who he is. That sounded exactly like Rudolf Steiner's process of active imagination so I scurried to my library and found this book. The Secret story was not included in this volume, but as I read the introduction I came across the same quotation. Thus I finally came to read Chesterton for the first time. His stories are delightful examples of sleuthing by the use of the active imagination. Imagine this: an unobtrusive priest in monk's garb, stands silently by as famous police captains and Scotland Yard experts examine a crime scene for clues. Suddenly the small figure in brown makes a simple statement about the crime that leaves everyone flabbergasted by its insight, veracity, and unexpectedness. In the Twelve Fishermen in this volume, Father Brown apprehends the perpetrator of a heinous crime that had been committed right in the sight of unsuspecting observers, while Father Brown, in an isolated darkened room out of sight of the crime, had deduced both the existence of the crime and the criminal as he listened to the footsteps in an adjacent hallway. Chesterton's stories are delights of brevity: one is almost just beginning to understand that a crime was committed when the good father announces the denouement. Insightful, intriguing, often humorous, Father Brown certainly deserves a bright star in the constellation of Literary Detectives alongside Sherlock Holmes, Miss Marple, and Hercule Poirot. I had a glimpse of the impact that Chesterton had on pre-radio culture in England, when in Brideshead Revisited Sebastian's mother read Chesterton stories to the gathered family and friends on a typical evening before bed. One would be hard put to find such gems as the stories in this volume on a typical evening in TV Land today. Also titled for the English ear, Philosophy of Spiritual Activity.